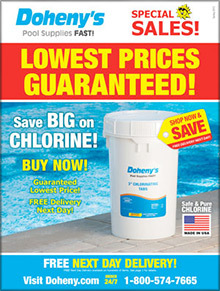 Doheny's Pool Supplies Fast is one of the leading discount pool supplies catalogs in the country with eight regional warehouses and more than 50 years of experience under their belt. Find all of your swimming pool supplies at affordable prices from discount pool chemicals to discount pool liners, pool parts and accessories. Your free shipping will be applied automatically to your cart at checkout.